← Fun Friday: Fall in love for only .91 cents! When the town of Pompeii was buried in ashes in 79 AD, not everyone was taken by surprise. At least one person knew what was coming, Valerie Brooks, an involuntary time traveler from Victorian England, but her foreknowledge doesn’t help her. Declared a witch by the townspeople of Pompeii and sold into slavery, she has to find a way to make her master, Christos, believe her so they can escape the town before Vesuvius erupts. But given the mistrust between them fired by the jealousy of her master’s scheming lover, Valerie finds her influence dwindling as the deadly time approaches. Racing against the impending destruction of Pompeii, she must not only decipher the mystery of her time-shift, but the mystery of love as well. The last thing Valerie could remember was the violent earthquake. She remembered it shaking the grotto where she had gone for safety. She remembered the ceiling caving in around her. She even vaguely remembered she had been hit on the head, but there was no bump or pain. But that’s all she could remember. How did it come to be, then, that when she woke up, the ceiling was still intact? It didn’t make any sense at all to her. And when she climbed down from the structure, the street around it was neat and tidy, not overgrown with vegetation as it had been when she’d started out this morning. The tombs were well tended, with fresh flowers placed in offering to the gods. As she left the tomb, she became even more confused. And more than a little frightened. There were a few people standing nearby, dressed in flowing robes and togas of cream-colored linen and cotton. They immediately stopped talking when she had emerged and looked at her strangely, making that odd forked symbol with their fingers Signore Fiorelli had shown Reggie and her last night. The group began walking, cutting a wide path around her. When Valerie tried to speak to them, they hurried away. One of them ran ahead of her, shouting in – no, she couldn’t believe what she was hearing – was it Latin? She followed them with her eyes as the people hurried toward the city. She started to take a step, then froze. She stared straight ahead, eyes wide. The city! There it stood, Pompeii, in all its untouched glory. Every column and building was in perfect condition, the paint and stucco finishes well maintained. Even the iron gate was free of rust and looked to have a fresh coat of black paint over the metal. A fountain situated at the fork of the road in front of her flowed with fresh water and several children stood around it, laughing and splashing. What had happened to the tumbled down ruins she’d been visiting only hours before? Where had they gone? How did they come to be replaced by this living and breathing town? For heaven’s sake, was this another dream or had she died when the grotto collapsed and this was to be her eternal punishment? She placed a hand to her head as she felt the ground begin to spin. She took a deep breath and steadied herself. Well, she couldn’t stand here all day. She had to find Papa. He’d know what to do. She reached into the grotto, retrieved her cane, and began to walk. Valerie re-entered Pompeii through the massive stone columns that flanked the gates as a crowd of people began to gather around her. “We saw her climb out of the tomb. She was trying to raise the dead!” Somewhere in the mob, a small child began to cry. “No!” Valerie screamed as a man grabbed her. “I don’t understand. I’m not a witch! Stop it, please,” she pleaded with him. He kicked her legs out from under her. She fell hard to the ground, gasping for air. Valerie planted her cane firmly on the ground and pulled herself up. What had she done to deserve such treatment? Well, he could talk all he wanted about the senate, but there was absolutely no way she would go to jail. She looked around, hoping to find a way through the crowd. She had to get away and hide for a while, until she could figure out what had really happened to her. The man turned to face her again. With a sneer, he took a step closer. Valerie held her cane out in front of her and swung it in a wide arc. It came down hard on the man’s shoulder and he stumbled backward. The man turned on her, his eyes narrowed, and ripped the cane from her grasp. He slammed it down over his thigh, breaking it in half. “Now let’s see you do your magic without this.” He threw the pieces down hard on the ground. “What are you doing?” Valerie screamed. She fell to her knees and retrieved the fragments. Accusations flew around her. Struggling to her feet, she put her hands over her ears and began to shake all over. The same images that had disturbed her dreams just last night were materializing before her. Another man came at her, brandishing shackles before him. Balancing on her good leg, Valerie kicked at him with her other foot. With little effort, he knocked her to the stone paved street. She cried out as a sharp rock ripped through her blouse and gouged her skin. A woman held her head down while the chains were clamped into place around her ankles. “Why are you doing this?” she cried. The men yanked Valerie to her feet and gave her a little shove. Without a cane, she stumbled, catching her balance just before she fell. Someone laughed and threw a rotten pomegranate at her back, striking her squarely between the shoulders. Valerie spun around, teetering, and the crowd backed away a little. She scanned the dark eyes that bore into her. Everyone was caught up in the moment. There was no aid to be found here. She looked past them. There was the statue of Dionysus she’d seen only yesterday, but the building next to it was completely intact. My God, how did I come to be in ancient Pompeii? Her head swam as the crowd closed in around her again. The people circled Valerie as if she were a wild animal. They started moving and she stumbled again. She clutched her stomach. She couldn’t catch her breath. Two men grabbed her by the arms just before she hit the ground, forcing her to move along or be trampled. Frantically, she looked about. Was there no one who could help? Mama? Papa? Signore Fiorelli? That was when she saw him. The man in the window. Why had he seemed so disturbingly familiar to her in this strange and distant place? It was as if she should know him – should know his name, where he lived, how he looked when he slept. Perhaps it was only because his features were like the patrician busts she’d seen at the museum in London. Straight nose, full lips, heavy lidded eyes. She’d studied and sketched them all several times over until she felt as if she knew each and every person. He looked down at her now and she saw something in those deep ebony eyes. Was it compassion or simply pity? Would he be the one to help stop this madness she knew would soon consume her? She couldn’t tell for certain but only prayed it was so as the crowd pushed her again and he disappeared from her sight. Like what you’ve read? 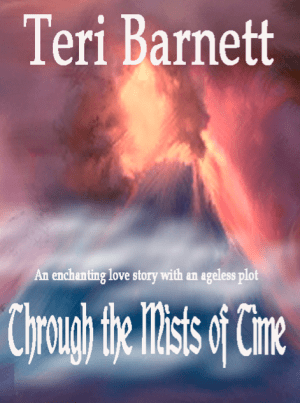 You can purchase Through the Mists of Time by Teri Barnett, right here. or you can purchase it on amazon. Connect with Teri online via facebook and twitter, and check out her web site.